The quotable quotations of McDonald's visionary Ray Kroc are as iconic as the globally recognized and internationally pervasive restaurant brand that he created. Restaurant and retail industry leaders who want to know about building brands couldn't have a more successful role model than Ray Kroc. 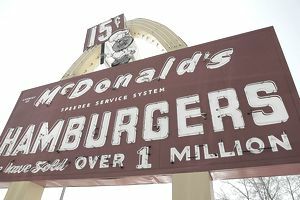 When Ray Kroc franchised the first McDonald's restaurant in Des Plaines, IL on April 15, 1955, it wasn't just the opening of a restaurant, it was the birth of a franchise system, one of the most valuable American retail brands, and an international fast food empire. Kroc was not the inventor of burgers and fries, fast food, or retail franchising. But Kroc was the inventor of the McDonald's operational systems and the visionary behind the McDonald's brand. What diners around the world take for granted was once just a vision in the mind of Ray Kroc. These quotable quotes from one of history's most famous fast food retailing leaders and legendary retail icons will reveal what Kroc was thinking and learning about the retail business as he was building the world famous McDonald's fast food franchise chain in the U.S. When Ray Kroc talks, both restaurant and retail leaders would be well advised to listen to the wisdom and inspiration of a legendary retail founder. "I put the hamburger on the assembly line." "We're not in the hamburger business. We're in show business." "When I saw it working that day in 1954, I felt like some latter-day Newton who’d just had an Idaho potato caromed off his skull. That night in my motel room I did a lot of heavy thinking about what I’d seen during the day. Visions of McDonald’s restaurants dotting crossroads all over the country paraded through my brain." "McDonald's is a people business, and that smile on that counter girl's face when she takes your order is a vital part of our image." "The success of additions such as the Filet-o-Fish, the Big Mac, Hot Apple Pie, and Egg McMuffin…each evolved from an idea of one of our operators. So the company has benefited from the ingenuity of its small businessmen." "I didn’t invent the hamburger. I just took it more seriously than anyone else...We take the hamburger business more seriously than anyone else." "It requires a certain kind of mind to see beauty in a hamburger bun. Yet, is it any more unusual to find grace in the texture and softly curved silhouette of a bun than to reflect lovingly on the hackles of a favorite fishing fly? Or the arrangement of textures and colors in a butterfly's wing? Not if you're a McDonald's man. Not if you view the bun as an essential material in the art of serving a great many meals fast." "Perfection is very difficult to achieve, and perfection was what I wanted in McDonald's. Everything else was secondary for me." "The McDonald brothers were simply not on my wavelength at all. I was obsessed with the idea of making McDonald's the biggest and the best. They were content with what they had; they didn't want to be bothered with more risks and more demands." "We provide food that customers love, day after day after day. People just want more of it." If any of my competitors were drowning, I'd stick a hose in their mouth." "The two most important requirements for major success are: first, being in the right place at the right time, and second, doing something about it." "It's easy to have principles when you're rich. The important thing is to have principles when you're poor." Starbucks Founder Howard Schultz on "Building World Class Brand"